The fair at Smithfield dates back to the 12th century. Held to celebrate the Feast of St. Bartholomew, it originally took place on 24th and 25th August but during Charles II's reign it was extended to a fortnight. 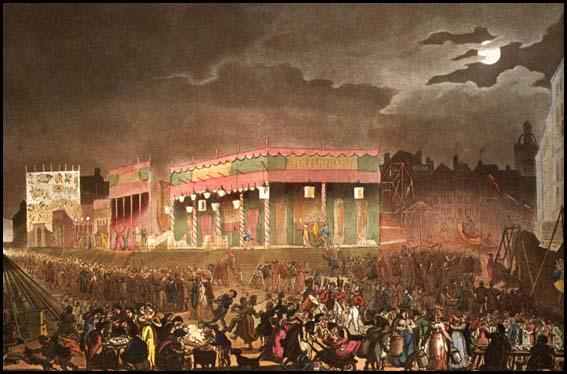 By the 18th century St Bartholomew Fair was one of the most spectacular national and international events of the year. It featured sideshows, prize-fighters, musicians, wire-walkers, acrobats, puppets, freaks and wild animals. Smithfield like Tyburn and Newgate was also used for executions. Nearly 300 Protestants were burnt at the state here during Mary Tudor's reign. In the 19th century Smithfield established itself as the largest meat market in England. Smithfield was also an important horse and cattle market until 1855 when livestock was sent to the Caledonian Market in Islington. In 1868 a market hall with an iron and glass roof was built at Smithfield. The print is a representation of Bartholomew Fair. A number of youths, each with the lass he loves, are carelessly disporting in the swings; indeed so carelessly, that one of them seems to have fallen out. The surrounding scenery; St. Bartholomew's Hospital, the church and the houses of Smithfield give value to the scene.